If you are looking for a TV that will provide amazing and enjoyable user experience at a really great price, then look no further because this TV might be ideal for you. It is true that the Sceptre E505BV-FMQK does not offer all the latest, fancy technology like streaming capabilities or internet, but you probably should not let that put you off since this great model shines in other areas. With its super thin profile as well as big 50-inch screen this TV offers incredible value for your money. This is a stylish and sleek LED 1080p HDTV with MEMC 120 that allows you view in crystal clear, sharp, and crisp images in order to provide enriching and realistic viewing experience by eliminating all the motion blur. It is ideal for any room in your house, while emitting amazing and vibrant colors. You are also able to connect all your favorite devices to this TV at one time thanks to its 3 HDMI ports. 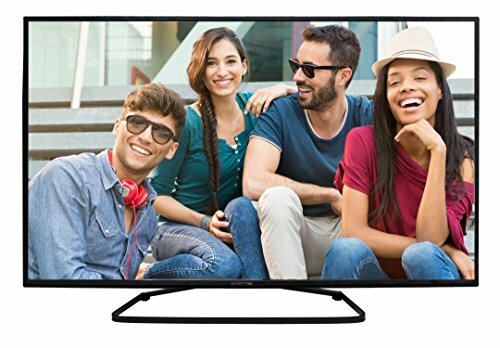 In addition, this great HDTV boasts an MHL port which allows you connect your everyday mobile device to the TV for an enhanced viewing experience. Overall, this TV is a great option if you are looking for clear, crisp images and excellent color reproduction. Anyone who loves watching sports or movies will surely appreciate how great they look, without any noticeable blur or judder when the fast action scenes are on. At first sight, this piano black TV looks pretty standard in design, but this is a very stylish and modern looking HDTV, especially if you consider it is a budget one. This LED TV boasts a slim frame as well as super slim bezel with sleek brush pattern which protects the TV from scratches. The Sceptre E505BV-FMQK will immerse you into the enjoyable action on screen with its fast zooming and panning, and you will definitely be able to see the difference in the entire viewing experience as an whole, particularly if you are getting this TV as an upgrade from an LCD TV that has a 1-inch plus bezel. This TV weighs 37.5 pounds, and measures 44.2 x 17.7 x 28 inches, and this is not that big at all if you take into consideration that it offers a 50-inch screen that is large enough for your family room, living room or just about any room in your home. This model is also VESA wall mountable. It is extremely easy to set up this TV which is one of the great advantages of having a simple television without all the bells and whistles. It is a simple plug and play television meaning exactly what is says – just plug and play it. It will be running within a couple of minutes after unboxing it, and its very helpful onscreen menu will guide you through the settings like the color and sound settings that are covered each step of the way. There are some great features included with this TV, such as the MEMC rating of 120 (Motion Estimation and Motion Compensation), which is helpful for the image stabilization as well as for getting things judder free and smooth while watching fast moving sports or action movies. Moreover, the DTS SRS TruSurround HD works surprisingly well considering the small built-in speakers, and the sound on this budget TV is pretty acceptable for your everyday viewing. For all those who want to stream and enjoy many entertainment channels, the Sceptre E505BV-FMQK is ROKU ready which means they’ll get completely integrated streaming up to 1080p HD, as well as over 750 entertainment channels. As far as the ports on this TV go, you get your video right and left ports, a Headphone Out, a PC-VGA port, a Composite/Component port, and a Digital Coaxial Audio Out, aside from, of course, a USB port and 3 HDMI ports.